You’ve coded your project with your x-axis step pin on GPIO11. But my device has it on GPIO3. Or even worse, I use a a servo and counter, which doesn’t have a concept of a step. How do we resolve this? If instead of considering the device itself when coding the logic, what if we were to abstract the meaning of the device from its behavior? That’s the basic idea behind Behavior-Device abstraction. Say I’m building a Unmanned Aerial Vehicle (UAV). I have a navigation behavior which needs realtime orientation data. A typical orientation circuit requires a Gyro and accelerometer for accuracy and drift compensation. If the navigation system had to deal with those calculations, that code becomes unwieldy. However, if it were coded to a single OrientationDevice, then the implementation of that device could be two sub devices – the GyroDevice and AccelerometerDevice, and can build a homogenized notification of orientation changes. What if a manufacturer were to build a single chip that handles both and provides a single interface to it? All one would need to do is replace out the Orientation device without rewriting the Navigation behavior. The example above described a composition – Each component has a singular responsibility. These are aggregated into a composite or logical device, which then can be actioned upon or notified from independent of the internal implementation. RepRap has 1 main behavior – The GCode interpreter. It receives commands from the host machine, and drives two logical components – the extruder and the Cartesian bot. The Cartesian bot is composed of 3 linear actuators. The Extruder has a temperature sensor, heater and feed device. The RepRap project uses Stepper motors for linear actuation, with end stops for collision avoidance and homing. 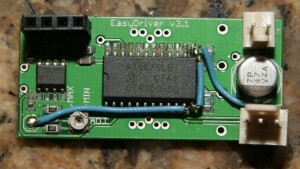 It could be implemented using a servo motor or linear stepper driver. Since driving the linear actuator is now abstracted from the behavior, changes to the driving mechanism becomes much less complicated. In other words, the behavior tells the bot where to go, the bot figures out how to get there, and the linear actuators figure out how to do it. Making an LED blink or driving a single stepper using the Arduino is very easy – pulse a pin in the Arduino loop handler is all you need. However, as builds become more complex, there is often the need to manage multiple devices. The RepRap firmware is such a project. The firmware has numerous steppers, motors, heaters, fans and sensors – it is chalk full of features. The developers have literally performed magic with the tiny little Arduino. However, I believe they will admit that the code base is becoming a little unwieldy and difficult to modify. As an operating systems developer, my job is to identify patterns in application development, build abstractions which simplify these common cases and generate boiler plate or error prone code. In my post on the RepRap firmware refactor, I described several design patterns which are applicable to not just RepRap, but many other complex embedded projects. The best place to start is with the root of all evil – the event loop. Event driven programing is a staple of modern application development. In my experience, event driven patterns are not as prevalent in embedded development – it’s a shame, because it is very useful. The main conceptual leap requires the developer to give up control to the power of the loop – a leap that is often very difficult as they are used to complete control. I’ve completed an implementation, which in its current state is more of a timer loop, but will grow to enable queued events (both on and off board). This code is currently checked into the RepRap source forge repository. It is only dependent on the Dynamic Array implementation checked into the tree as well. // is greater than maximum object file alignment. //  Derive from this class to implement a periodic timer. //  maintianing a timer, designed to be memory efficient. //  This class implements the main loop. //      servicing, or timed servicing. You are currently viewing the archives for March, 2009 at OoeyGUI.